After much “mulling-over” I finally decided to get a Wireless Internet account. I looked into each of the obvious Vendors – 3, Optus and Vodafone. 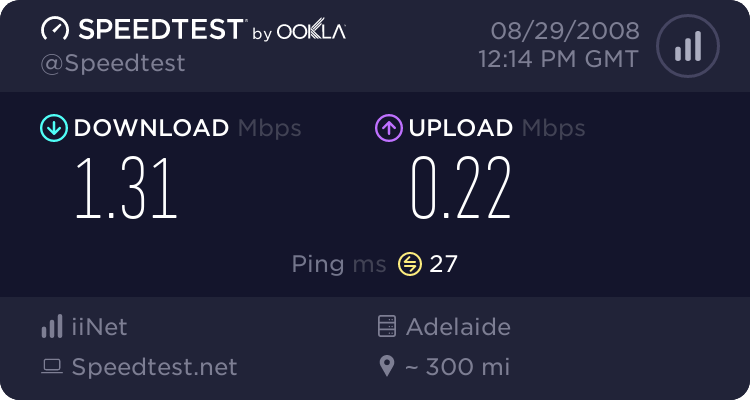 Of those only Optus had a pre-paid service – the other two offered only 24 month plans that required a credit check and lots of stupid questions. On closer inspection though Optus’s 2Gb for $30 pre-paid plan began to look less inviting. In addition the pre-paid blocks expire after 30 days and the fine print states that usage is measured in 10Mb increments. So connecting and downloading a 1Kb file will accrue 10Mb of usage! On a 2Gb plan that’s only 200 individual connections?! No credit checks and stupid questions – even if you’re not an existing customer (which I am). Ability to change up/down quota with no penalties. Half price for first 12 months – making it on par with best 3 and Optus plans. Trust me I was amazed as anyone – I now have a Bigpond account. This morning I would have expected the end of time to have occurred prior to that event happening. My 1500/256 ADSL account with Internode. My new Next G account with Telstra. 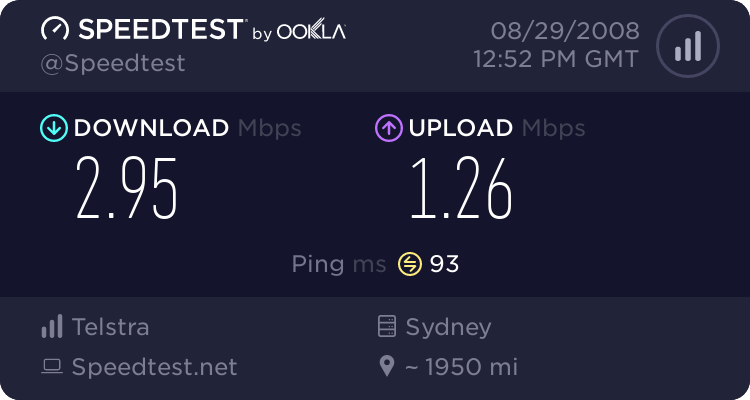 Unfortunately I’m unlikely to ever use that speed. The 1Gb plan is just enough for e-mail, messenger and occasional web browsing whilst I’m on the move.